We’d love your help. Let us know what’s wrong with this preview of Flashlight Night by Matt Forrest Esenwine. To ask other readers questions about Flashlight Night, please sign up. The story is pretty average for a story. Kids get into antics playing imagination games. Big deal. NO IT IS A BIG DEAL. You know why? THE M.F'ING ILLUSTRATIONS!! They're ingenious. Instead of a typical story about a flashlight revealing that the scary shadow in the corner is just a chair, this flashlight reveals swaths of imagination and intrigue. The cat in the back yard becomes a tiger in a jungle. The deck turns into a pirate ship. It's beautiful and so, so creative. I loved that this book to The story is pretty average for a story. Kids get into antics playing imagination games. Big deal. I loved that this book took the fundamental fear-of-the-dark and turned the comfort of the-monster-is-just-a-tree-outside completely on its head. There's no need to be afraid of the dark. Explore the dark! That isn't just a cat in some weeds. It's a tiger and you're on a g.d. safari. Thanks to the publisher for providing me with a galley of this title for review purposes. Flashlight Night is a picture book that educators and parents will be so excited to share with children, both at home and school. It demonstrates exploration, imagination and curiosity, as well a sense of play that almost jumps off of the pages in Koehler's illustrations. The text is sparse and lyrical, with no more than 4 lines of text on any given page spread. The opportunities for flashlight play after re Thanks to the publisher for providing me with a galley of this title for review purposes. A delightful rhyming picture book that takes readers into quite an adventure. When the light's out, the imagination turns on! Cute, three kids have adventures at night with their flashlight to lead the way. Until someone says lights out. Then all go to sleep. This book is absolutely stunning! There is so much to notice and the text is beautiful as well. I look forward to sharing it with students. My son and daughter will love this one! Gorgeous, gorgeous picture book. Full of beautiful words and amazing illustrations. Shines the spotlight (see what I did there??) on creativity and imagination! Beautifully illustrated by Fred Koehler! Fred Koehler's illustrations are incredible in this book. The flashlight beam illuminates parts of the page to reveal imagination and adventure right in the backyard. It's even more fun to read in the dark with your own flashlight. I love picture books, but I especially love them when the author’s words are poetic and the illustrator’s imagination brings forth the very best of those words into something that can be enjoyed by all ages. This book by debut author Matt Essenwine will be out in early September. I was lucky to win a copy from Matt, who signed it for my granddaughters, who adore it. I have my own copy too, and think I love it just as much as they did. Now I wish I had a class to read it to! Matt begins to celeb I love picture books, but I especially love them when the author’s words are poetic and the illustrator’s imagination brings forth the very best of those words into something that can be enjoyed by all ages. This book by debut author Matt Essenwine will be out in early September. I was lucky to win a copy from Matt, who signed it for my granddaughters, who adore it. I have my own copy too, and think I love it just as much as they did. Now I wish I had a class to read it to! Matt begins to celebrate adventure in his rhyming story of what only a flashlight can do: “Leads you past old post and rail/along a long-forgotten trail/into woods no others dare,/for fear of what is waiting there.” Fred Koehler takes those words and creates a story of three children who are off to a tree house sleepover, flashlight in hand. Here go the adventurers, a girl, a boy, a younger boy with teddy bear and every time they shine that flashlight, new scenes metamorphose into adventure, like from a swimming pool into the sea complete with pirate ship. The words read like a tale to be read aloud at night, the pencil sketches with a bit of color show the tension, and there is often a tiger sneaking into the scene! I imagine reading this aloud to a group who just might hold their breaths until the surprise ending. Summary: Three children drag a stack of adventure books, bedrolls and a flashlight to their backyard treehouse. Soon they sally forth, using a flashlight to "open up the night" revealing a shadowy and increasingly fantastic world replete with tigers, hieroglyphs, ancient tombs, pirates threatened by kraken and castles. As the adventure proceeds and the children find themselves in increasing danger, a narration of simple couplets spells out the events in rhyme until the three use their wits and teamwork to elude these threats and return to the safety of the treehouse where they read a Jules Verne novel by flashlight until lights out. Strengths: Delightful illustrations, allusions to classical adventure novels, (Around the World in Eighty Days, Treasure Island) good pacing and an excellent coordination between the writer and the illustrator. Critique: Recommended: a fun book which encourages imagination and portrays children enjoying the classics. I’ve never read a book under the covers with a flashlight before. I mean I was the eldest of four girls who shared a bedroom...it was two in a bed so any privacy was non existent. Sooo, what happens when you have a flashlight, a book and the dark of night? I will let you know...I’m giving this book along with a flashlight to my grandson, who is almost three. This will be a new adventure for the both of us and I can't wait to share it with him! 5 for plots, 4 for illustration. I loved this way how this book stimulates I give action of kids. Imagination itself, constructed in proper way, it an essential element for kids to deal with obstacles in the future, and a way for them to enjoy life more. The end of this book definitely making it great to be a bed time story too. Perhaps kids go to sleep and begin their adventure in dreams. The texture of the illustration is a bit strange, not sure if that is the creation of the illustrator, but 5 for plots, 4 for illustration. I loved this way how this book stimulates I give action of kids. Imagination itself, constructed in proper way, it an essential element for kids to deal with obstacles in the future, and a way for them to enjoy life more. The end of this book definitely making it great to be a bed time story too. Perhaps kids go to sleep and begin their adventure in dreams. Esenwine, Matt Forrest Flashlight Night, illustrated by Fred Koehler. PICTURE BOOK. Boyds Mill Press, 2017. $17. A trio of friends take their flashlight out into the night and use their imaginations to encounter many mysterious adventures. What a great flip from the regular flashlight book. Usually the flashlight is used to stop a child from being scared by showing what is there vs their imaginings. This time the flashlight helps them imagine the different worlds they enter. It is a little dark, b Esenwine, Matt Forrest Flashlight Night, illustrated by Fred Koehler. PICTURE BOOK. Boyds Mill Press, 2017. $17. What a great flip from the regular flashlight book. Usually the flashlight is used to stop a child from being scared by showing what is there vs their imaginings. This time the flashlight helps them imagine the different worlds they enter. It is a little dark, but I think that helps blur the line between reality and fantasy in a fun way. I had the pleasure of reading this title in advance during an art show featuring Fred Koehler's work. It is a great adventure with appeal for all ages. It has inspired me to plan 3 different programs for various children's groups at my library. Read and enjoy. Can't wait for my copies to arrive and be able to share with my young explorers. One reason this book is such an enjoyment is the illustrations and the way the illustrator uses the flashlight throughout. I love how the flashlight has the imagination showing from the characters perspective. I can just imagine how exciting this book would be for a child. SO cool! The story also has great descriptive words throughout. This book was incredible! My professor showed it off during class and I thought to myself that I should definitely go read it. The changing world that the flashlight unfolds to the characters in the book is something that I think should have been thought of sooner. I think it is ingenious. The illustrations are the real MVP in this book. It really does a good job of portraying what a child thinks when they play. I love fantasy fiction like this. Tigers, castles, pirates, sea creatures and more fill the imagination of these young adventurers equipped with a flashlight at night. Or is it the power of the flashlight to illuminate the pages of the book they are reading? Not your ordinary bedtime story! This brings back my memories of summer evenings chasing friends around the yard. I could feel the cool grass, smell the night, and remember the chill of imagined monsters lurking just beyond the edge of the flashlight's edge! Three children use their flashlights to light up their nighttime backyard, and use their vivid imaginations to fill each corner with incredible otherworldly scenes. From a ferocious tiger to a giant squid, a swashbuckling pirate to an Egyptian god, there’s no limit to the worlds the children conjure up. The gently rhyming text never lets the scenes become too scary or intimidating, and the characters’ bedtime adventures are eventually brought to a satisfying end. Fred Koehler’s highly detailed ill Three children use their flashlights to light up their nighttime backyard, and use their vivid imaginations to fill each corner with incredible otherworldly scenes. From a ferocious tiger to a giant squid, a swashbuckling pirate to an Egyptian god, there’s no limit to the worlds the children conjure up. This is a fun book about three kids who use their flashlight outside at night and imagine all kinds of adventures. On one side the image shows that they are in a "safe" backyard, but on the flashlight lit part of the image, you see what the kids are imagining. Near the end of the book you see the kids huddled up reading adventure books by flashlight. The illustrations are quite complex, so I would recommend this book for older preschoolers & elementary students. Kids enjoyed this and voted to This is a fun book about three kids who use their flashlight outside at night and imagine all kinds of adventures. On one side the image shows that they are in a "safe" backyard, but on the flashlight lit part of the image, you see what the kids are imagining. Kids enjoyed this and voted to give it 5 stars. It seems, perhaps due to the influence of the Great Lakes, there are more cloudy nights in Michigan than those graced by the glow of moon and stars. As the days get shorter and the nights get longer, those last walks of the day with your dog can be challenging. No matter how familiar the path, when darkness descends everything changes. Even with your companion's acute senses at work, it is more comforting once you've clicked the switch on your flashlight. As you move it around to your left and ri It seems, perhaps due to the influence of the Great Lakes, there are more cloudy nights in Michigan than those graced by the glow of moon and stars. As the days get shorter and the nights get longer, those last walks of the day with your dog can be challenging. No matter how familiar the path, when darkness descends everything changes. Even with your companion's acute senses at work, it is more comforting once you've clicked the switch on your flashlight. As you move it around to your left and right and then back to the front, the well-known is illuminated. 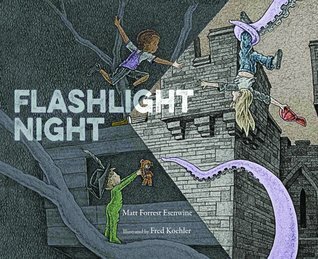 In Flashlight Night (Boyd Mills Press, an imprint of Highlights, September 19, 2017 written by Matt Forrest Esenwine with illustrations by Fred Koehler three children discover the opposite to be true. This book is awesome. The text is poetic, and the meticulous illustrations capture perfectly the thrilling balance between fear and excitement a nighttime adventure (real or imagined) can bring. Light or dark, real or imagined, this book blurs the lines delightfully. Very clever and imaginative illustrations and it’s fun to see which books the kids recognize. STUNNING illustrations, but the story was a a little boring. One of those books that will have kids poring over the pictures to catch all the details.